Your divorce papers have been signed and everything has been finalized. The chapter of your life that included your husband is over and now you want to move on with your life. You are ready to rebuild the family that you have and you are ready to get back out on the dating scene. But your children are resistant to the thought of you dating. How do you cope with this? The age your child or children are when you get a divorce makes a difference to how they will react to it. A child has not lived long enough to have any solid life experience and as a result fears that the absolute worst thing possible will happen. When their mother meets a new man their fear is that they will not be loved as much by their mother and that she will have less time for them as a result. This often works the same when their father meets a new woman as well. To comfort and reassure your child that none of these things will happen it is important for you to talk with your child often and to listen to what he or she has to say. Encourage your kids to talk about their feelings and show love, support and understanding. Do not tell your child that what he or she is feeling is wrong because this will cause your child to emotionally withdraw from you. Your kids need as much love and attention as you can possibly give them. They also need to be reassured that you are there for them and that they are a top priority for you. Many parents make the assumption that their children understand that they need to have a life outside of being a mommy but this is not the case. Whether you have a young child or a teenager they are not likely to understand this because they think your life revolves around them. It takes quite some time for most children to understand that their mothers need other people as well. Once you have met a new man get to know him well yourself before you introduce him to any of your children. You need to figure out if the relationship has the potential to become serious before you get your children involved. A man who is worth your time and your heart will understand this. The last thing you want is to introduce your kids to new men all of the time who come and go. This can cause them to be confused and insecure and also sad if they happened to really like the man. Teenagers often become protective of their mothers when it comes to who they date and you do not want to cause them any more worry than you need to. After all they have been put through enough already! Keep the new man away from your home when your children are at home until you are sure that he is a keeper. If you decide to get sexual then either go to his house or bring him back to your place if your kids are not at home (such as if they are staying with grandparents or their father for the weekend). If your children do not want you to date they will often show this by becoming clingy or by whining a lot or throwing temper tantrums. It is important to talk with your children about how it is time for you to start dating again. Be gentle and kind with their feelings. -Make your children aware that your dating is very much like the time they spend with their friends. -When you decide to introduce your children to a new man, prepare them beforehand. -Some children might assume you are dating because you do not enjoy spending time with them. Assure them that you enjoy being with them but you also need to spend time with other adults whom you share things in common with. -Start slowly. Spend a minimal of time with your new beau and work up to more time in order to assure your children that they are not losing you. -Set aside time with your children before and after your dates. Mommy and children time matters too. Empty nest syndrome is upon you. Are you ready to let your children fly on your own? Are you prepared for what this will mean for your life as well? As a mother you have always been used to being there to do everything from clean up scraped knees to wipe up tears to tuck your children into bed at night with a kiss and a wish for a good night’s sleep. But now the time has come to let them go. It can be a trying time for both of you. Your grown children are embarking upon their adult futures and you must step aside and let them live their adult lives. That can be difficult for any mother who is used to being hands on with everything. Just like baby birds, all children must grow up and leave home in order to develop into happy and healthy adults. Just as the adult children are starting down a new path so can the parents who are experiencing a phenomenon that is known as empty nest syndrome. What is this syndrome exactly and how do you cope with it? Empty nest syndrome is the name that has been given to the combination of mixed emotions that many parents feel when their last or only child leaves home to start a new chapter in their life. With a nest that is now empty many parents find the transition difficult to cope with. Older women and women over 40 in the past used to experience empty nest syndrome more readily than men because traditionally they were the primary caregivers for their children. In today’s society many men also play a paramount role in raising their children and therefore are struck by a maelstrom of emotions as well when they become empty nesters. However for single mothers empty nest syndrome can be even more difficult because there is no other parent –and spouse- in the picture. While change and separation may not be easy for you it is necessary for your son or daughter to leave your home and start an adult life of their own. While you will still be an important part of your adult child’s life you now must forge a relationship that is more adult in nature. You need to view this syndrome in as positive a light as possible. Talk with your adult child about the changes this will bring to your relationship and prepare yourself for the new adventures that lie ahead for you both. Now is the time for you to put more energy and effort into your marriage and to bring the focus back more on just the two of you. Once you become empty nesters you and your spouse can enjoy privacy in your home, reignite the romance in your relationship and may decide to put some long anticipated travel plans into play. It is smart to plan in advance of the day that you will see your child off to his or her new start down the adulthood path. Talk to your daughter or son about the future. Assure him/her that this is what is supposed to take place. Be encouraging and supportive. In the same way, before empty nest syndrome sets in talk to your spouse about the changes that are about to occur. Think about how you want to face the future together and what you would like to do. You may be surprised to discover that you and your spouse are on the same wavelength regarding your future dreams and plans. Do not make any big changes in your life or lifestyle right away when you are entering the stage of life when you will become empty nesters. It takes the average person anywhere from a year and a half to two years to adjust to their child being gone. Give yourself time to get used to the changes before you decide to do something major. After that, do what you wish to move forward! Divorce is not an easy life transition for anyone to cope with but it can be particularly painful for the children who end up feeling like they are caught in the middle. As parents who are getting a divorce you play the most important role in how your kids cope with the changes that are about to take hold in their lives. Your minor children need all of the help and support that you can give them to get through this traumatic experience with as few issues as possible. As a parent getting ready to split from your spouse you are dealing with a lot but you must consider what your child is going through as well. You must make it a top priority to assist your child in making the transition from the kind of life your family shares right now to the way it will be after the divorce is final and your spouse and you no longer live under the same roof. This sounds easier to do then it is in reality but what is most important is that you make yourself available whenever your child wants to talk with you about how he or she is feeling. Answer your child’s questions honestly and be understanding and supportive when he brings his/her concerns to you. It is a good idea to tell your children that you have decided to get a divorce together as opposed to each one of you telling them separately. Discuss with your soon-to-be ex-spouse beforehand how you plan to approach the topic and what you are going to say. Be as honest as you can be with your kids and be prepared for emotions that range from anger to sadness to confusion about the decision that the two of you have made. Tell your little ones as much as they need to know and that is it. Allow your children to feel their emotions and be prepared to be the bad guy for a while until they start to come to term with the reality. Let the truth of what is taking place sink in before you bombard your kids with the details of what life will be like once mommy and daddy are living separate lives. Some children think that they are responsible for the divorce so as parents you both need to assure them that that is not the case. 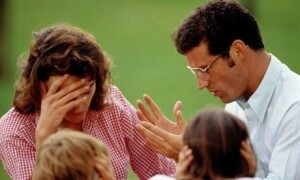 Let your children get angry or cry and express themselves to you just as you have expressed yourselves to them. You are preparing to mourn the loss of your marriage and your children deserve the same as they mourn the loss of the family life they have been a part of and enjoyed up to this point in their lives. Maintain the roles that you each play as parents. You continue to be the mother who does mom things and let the father continue to do dad things. Try as hard as you can to keep your children’s lives as normal as possible. While there will be changes to cope with in the weeks and months to come you must make every effort possible to maintain the status quo in your children’s lives and to keep everything on stable footing. It would be nice if divorce was amicable but often it is not. As spouses who are calling it quits you must remember that you must continue to co-parent your children. For that reason you need to dial down the amount of conflict that your children see in front of them. Argue as little in front of them as you possibly can. When you minimize the level of conflict this plays an important role in how well your kids are able to adjust to the changes that are swiftly taking place in their lives. It makes the adjustment easier for them which is exactly what you want. You want your children to be hurt as little as possible and this is how you help to make it so. When there is arguing to be done take it behind closed doors and keep it away from the ears of your little ones. Remember that your kids love you both so do not do anything to damage the bonds they have with either one of you.